In Central and Eastern Europe, the 'Old Europe' of cobblestones co-exists with mobile phones, horse carts fight for road space with cars, and farmers' markets compete with mega-stores. Western business professionals hoping to expand or start up new ventures in this complex environment must possess knowledge that is both comprehensive and subtle. What is it like to live and work in Central and Eastern Europe? How is business conducted there? What happened in Central and Eastern Europe to make integration into the rest of Europe so difficult? What important social and cultural issues must be mastered by Westerners hoping to flourish in this region? 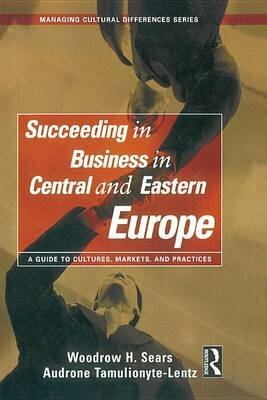 'Succeeding in Business in Central and Eastern Europe', the fourteenth title in the 'Managing Cultural Differences Series' answers these and many other questions. This book identifies a variety of factors, including an anti-business attitude and a resistance to Western-style change, that hinder some attempts at development within Central and Eastern Europe. It provides a frame of reference for understanding the "post-Soviet syndrome" - with its remnants of corruption and mistrust of managers and customers alike - that continues to haunt the countries of CEE. Dr. Sears and Ms. Tamulionyte-Lentz give readers solutions for overcoming the problems inherent in this region. They explain how Western executives can build relationships and find point of cultural "synthesis" with their Central and Eastern European counterparts and ultimately create a new and mutually beneficial work culture with their ventures. With understanding and insights on the cultural nuances of the region, 'Succeeding in Business in Central and Eastern Europe' can help all Western visitors, even tourists, who arrive at this increasingly popular destination.